On a recent (May, 2013) visit to Bamberg I went on one of my favorite bike rides, north to Freudeneck and Brauerei Fischer. 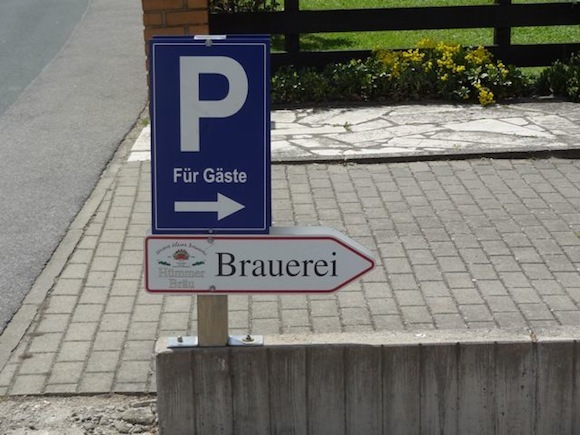 When I've done this in the past I would often make a stop for a quick beer at Brauerei Hümmer in Breigengußbach. But they no longer brew beer there so there was no point in stopping. But I had heard that there was a new brewery at a hotel in town, Pension Karin, so I stopped by. The word "pension" to me -- rightly or wrongly -- suggests an old building converted to lodging, somewhere between a boarding house and a hotel. 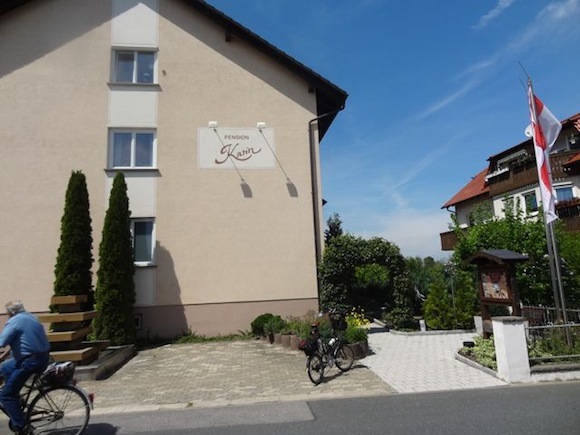 Pension Karin is a fairly large, modern building with a large back garden and swimming pool. Not at all what I expected. If you don't look closely, you might not realize there was a brewery within. I wondered back and could smell a brew in process -- great timing. Nobody was around so I walked in the actual brewery and shouted "hello." A man came out and offered to sell me a beer. Of course, I accepted, ordering the Zwickl. I told him I was a home brewer and asked if I could watch him brew. He seemed happy for the company and showed me around his brewery. His name is Karl Hümmer and he worked at the now closed brewery, which was owned by his brother. 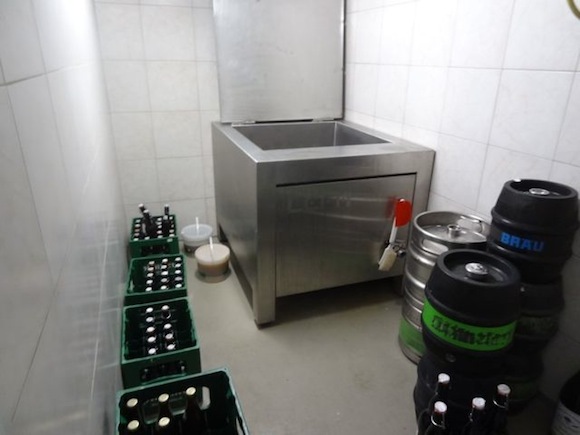 When the large brewery closed he decided he liked to brew and built this small brewery in the Pension that he and is wife (Karin) run. 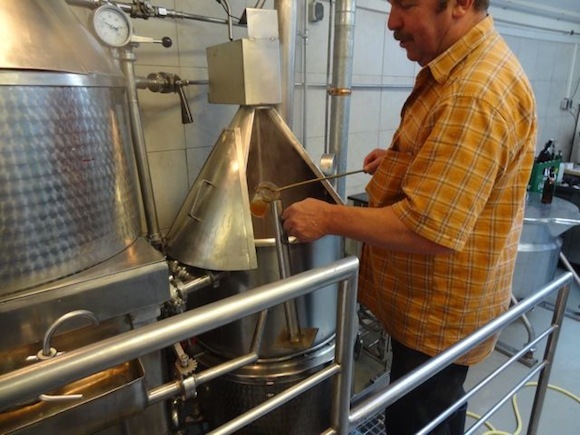 Karl brews twice a week, 150 liters at a time. 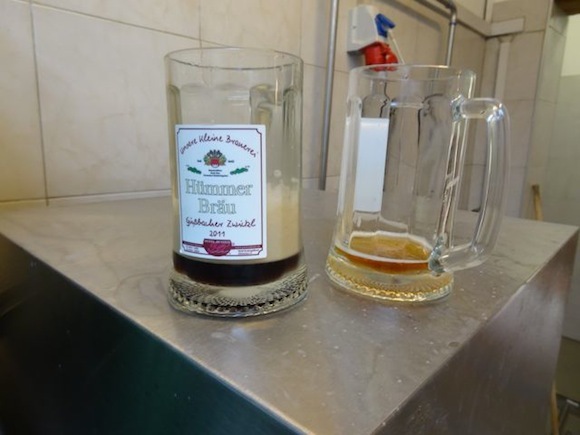 At the time he had only two beers (the Zwickl and a Hefeweizen) but he had plans to expand the range, with a Pils and Schwarzbier in the lagerkeller. 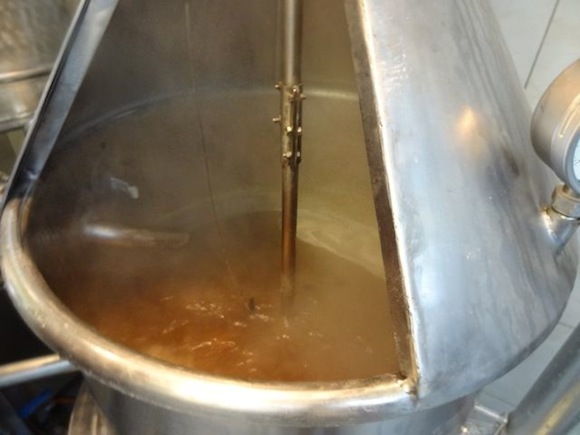 In the picture below you can see the mash and lauter tun on the left. Karl is checking the specific gravity of the brew to see if it is up to the required density. 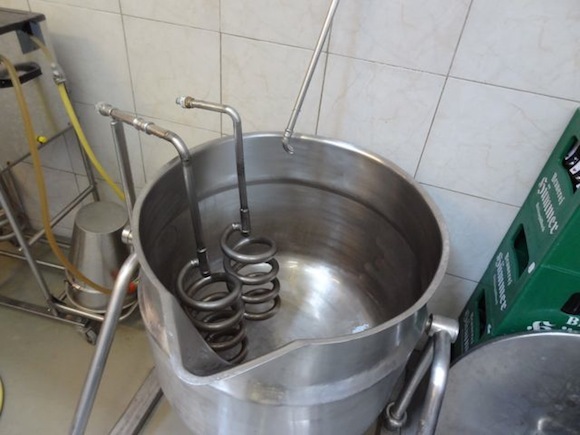 When the boil is finished, he transfers it into what his call his "kuhlschiff" (cool ship) He uses an immersion chiller to cool the wort down to the temperature where he can add the yeast. An interesting note is the water he uses for cooling (and cleaning) comes from his own well. He said the municipal water was too expensive, so he only uses it for the actual brewing water. The cooled wort is transfered (I did not ask how, I assume pumped) into the fermenter, which is an open square in a walk in fridge. 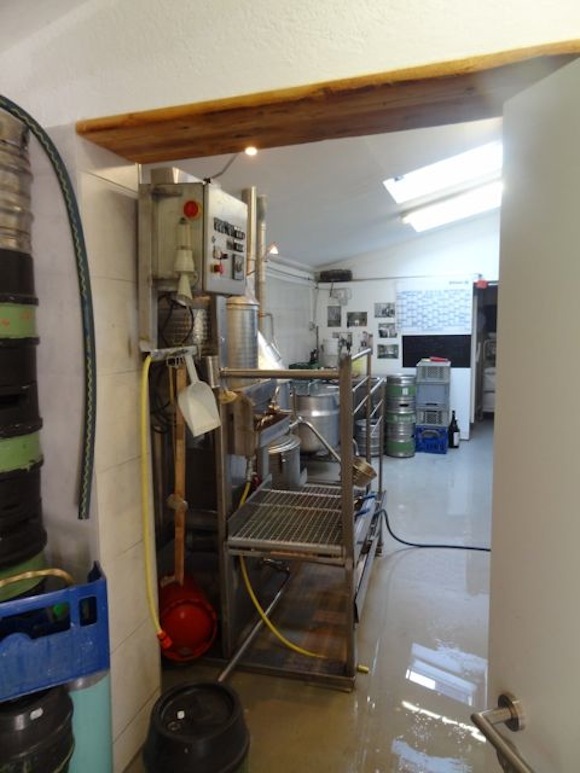 The little round things on the floor next to it are yeast starters, for this and (I assume) the next batch. It's also his beer storage locker. 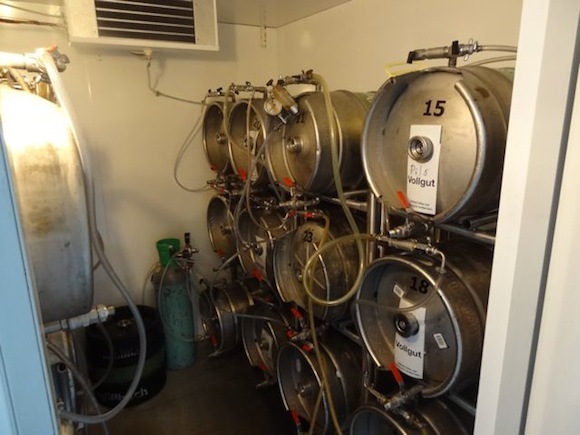 Most of the beer is served from kegs in the hotel. 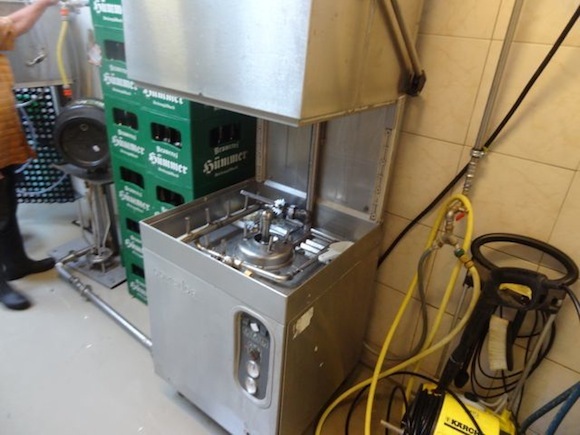 He has a commercial keg washer for cleaning the kegs. 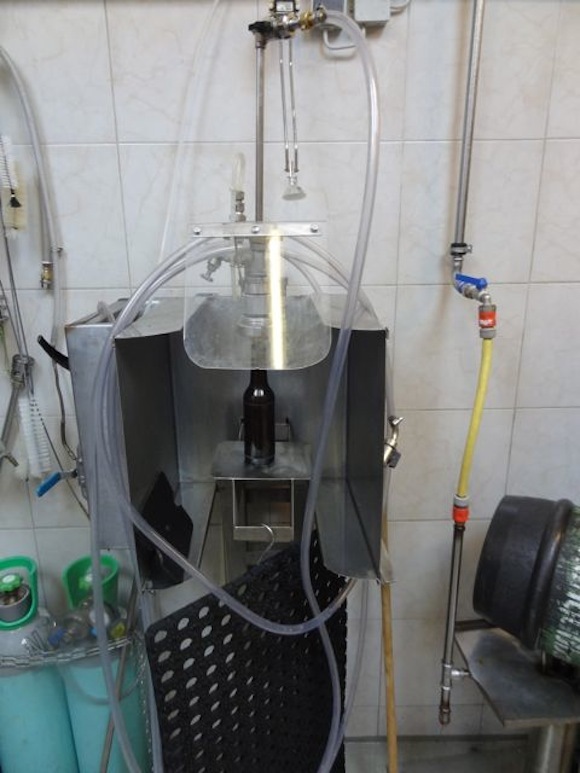 Bottles are filled one at time with a counter-pressure bottle filler. My guess is he doesn't do too many of those. 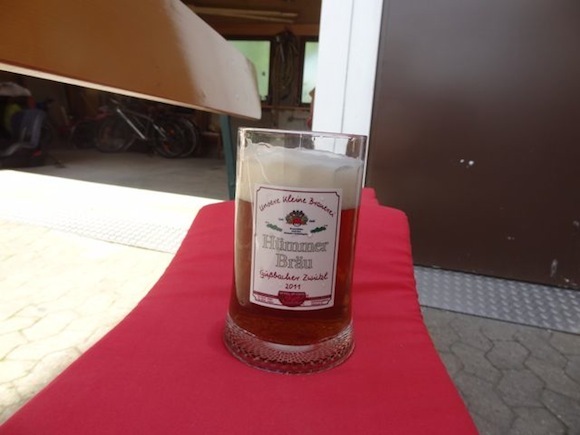 Karl offered me a taste of the new Schwarzbier, named 1642 -- the year the larger Hümmer brewery was founded. Very roasty and quite nice. I don't know what would happen if you showed up at the front door of the Pension and asked for a beer. There were a couple of benches set up in the parking lot by the brewery, so I guess there is some walk up business. It's definitely worth a visit if you find yourself in Breitengußbach. It is right along the bicycle route. Delightful article. Very informative and I can remember what I 've read, as well as, remember how to locate the place. I hope to visit the Bamberg area again soon-either on business or Holiday.